Thanks to Brooke Faulkner for returning to guest blog this month. Whether you have chosen to move into a tiny home, you pay an exorbitant amount to have a closet-sized apartment in New York City, or it just so happens that your dream home has a small kitchen, you are going to have to get creative with how you use it. The kitchen has always been a place where clutter seems to gather and where storage is always an issue, no matter how big or small the space. 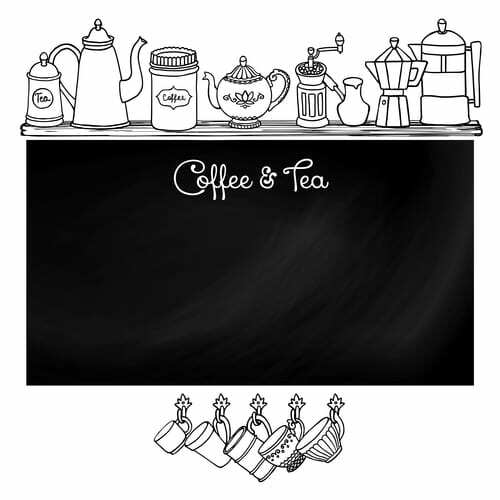 Making some custom changes to your kitchen to adapt to your personal wants and needs will help you see your kitchen as more of a place of zen than a messy clutter den. As you start to really investigate your kitchen, you may start to recognize negative space that could be used for additional storage and further organization. Start with looking at your sink area. What is that small drawer in front of the sink that doesn’t open? What a cruel design! 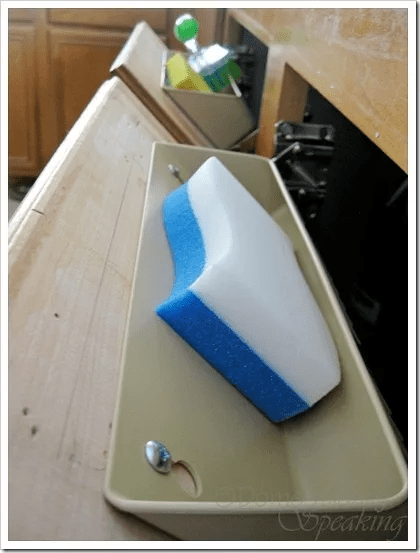 By removing the front of the drawer, installing a narrow pocket behind it and hinges on either side, you can make a sponge and nail brush holder that tucks right into that before unused spot. This allows you to hide the unsightly sponges and remove clutter from around the water tap and gain more organizational space! Another typically overlooked area is the space between the oven and the cabinet next to it. Usually, there is just enough space to install a spice cabinet that slides into the depth of the cabinet and when pulled out can visually display every spice you could ever want to cook with. Spices and condiments take up a silly amount of space. Another option for storage to free up counter or wall space is to install a spice rack, an absolute kitchen essential, on the inside of a cabinet or pantry door. A pantry door, if your small kitchen is lucky enough to have one, is ideal because the depth of the spice rack fits perfectly inside the door frame, not taking up any additional space once the door is closed. 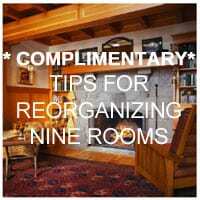 Utilizing the space available to you and recognizing when there just isn’t any left will be your best approach to removing the clutter from your kitchen. Small bits and pieces tend to collect on the surfaces of counters above anything else, making your kitchen feel even smaller. For the smaller recurring items, like notes to the family, mail, or hairpins, take advantage of the inside of the cabinet doors. 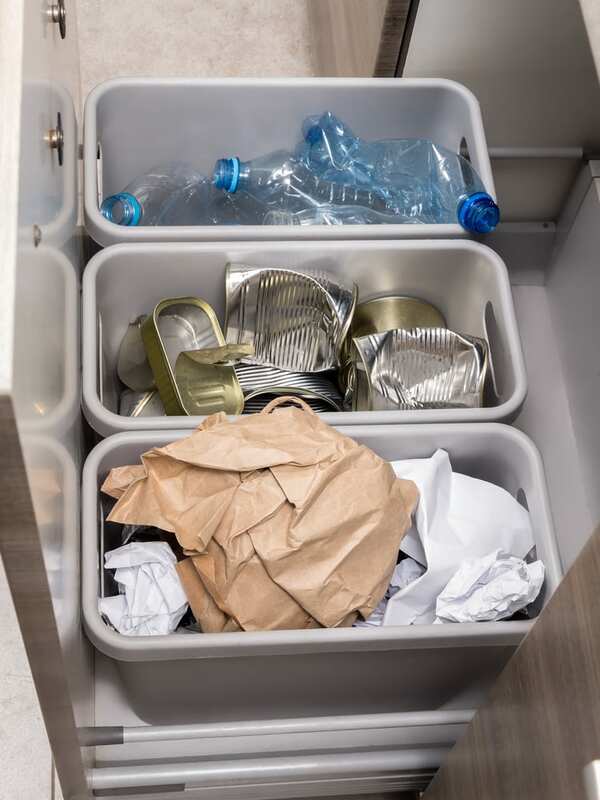 With a simple strong adhesive, you can create small catch-all containers that are out of view and not taking up any additional space. You can label the small containers so that other household members know how to best use them. 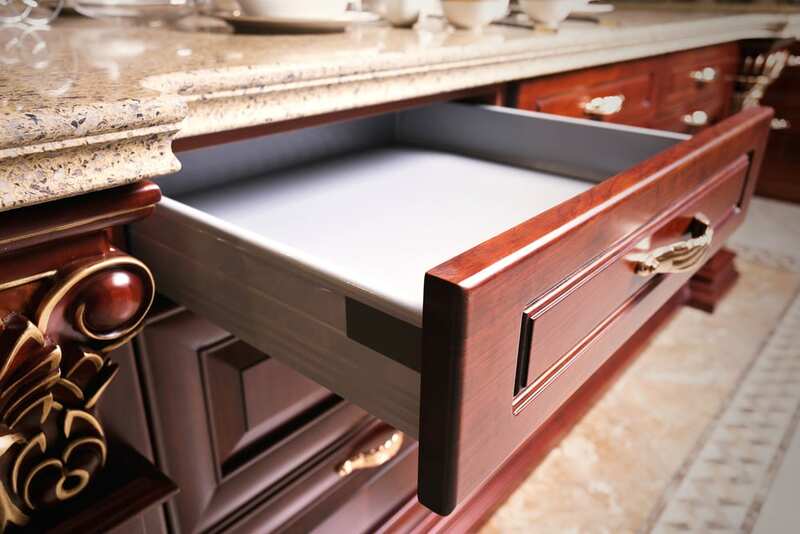 Organizing what lies within the cabinet drawers will also help to cut back on the number of items in your kitchen. Take for example the storage container drawer. In the typical household it contains various sizes of mismatched plastics that are haphazardly shoved into a general area. Consider upgrading to a stackable glass container set that simply has four sizes with color coded lids. 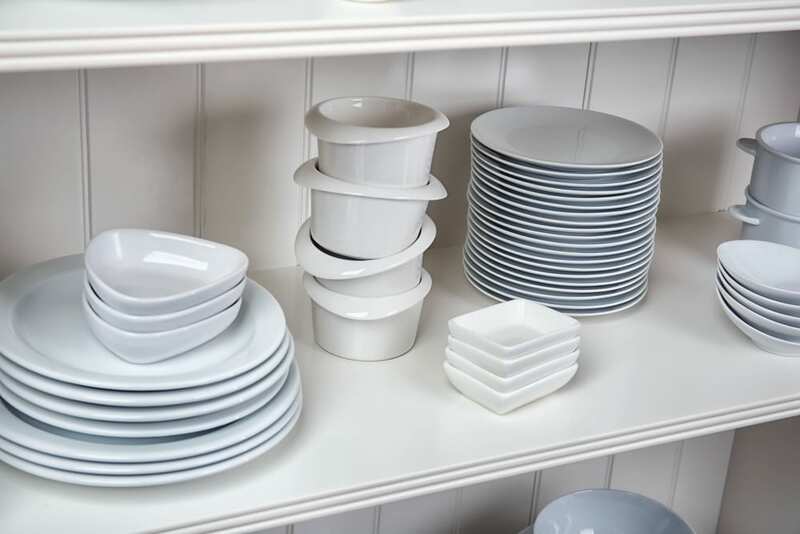 Having one stackable entity that can easily slide in and out of the cabinet could save you time and hassle for meals on-the-go and storing leftovers. 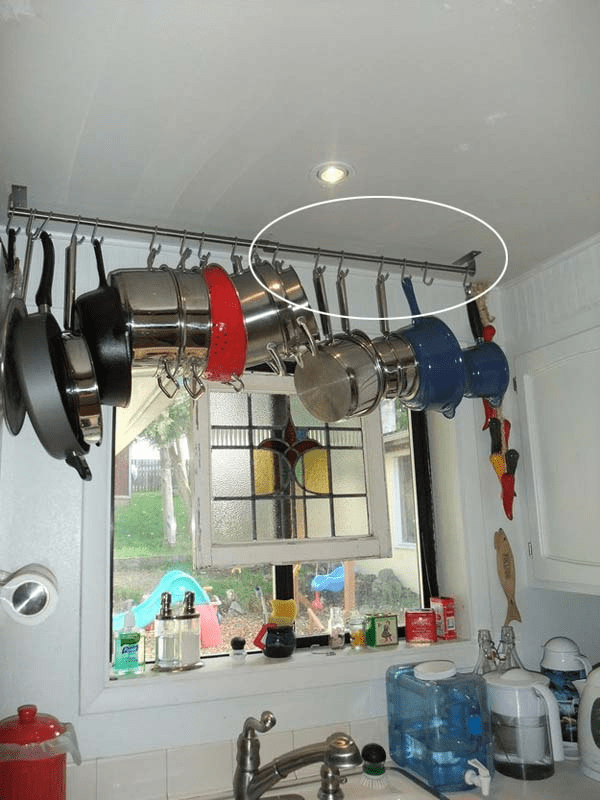 For that clumsy pots and pans drawer, take a second to look up. 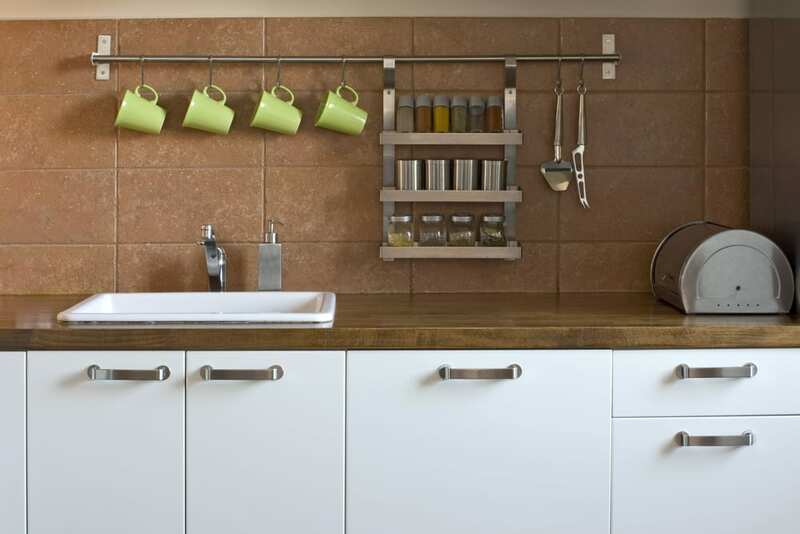 If your ceiling allows for it, consider installing a hanging pots and pan rack to allow for easy access and to free up one of your cabinets for additional valuable storage space. Once they are on display, you might also recognize that it is time to update the pots and pans collection of parental hand-me-downs that you have been hanging on to since college with the best and brightest new cookware. The kitchen seems to be the mecca for where dirt, food scraps and oily messes tend to build up. To alleviate less mess on the floor, opt to put your cutting board over one half of your sink. It cuts down on the amount of food scraps that end up on the floor and makes clean up that much faster. It reduces the wear and tear on your countertops and prevents against potential staining from items such as beets and turmeric root. An added bonus is that you can use it to cover up any dishes that you didn’t happen to get done if an unexpected guest stops by for a visit. Cooking in a small kitchen, there are areas that seem to get dirty again within a day of cleaning them. Try using natural cleaning agents to get your appliances looking like new without drowning yourself in chemicals. Using flour to scrub down those new stainless steel appliances will have them shining like new after a quick rinse. Additionally, you can use lemon juice to get rid of rust spots that may be on knives that you have on display and a bit of salt and lemon juice on your wooden cutting boards will both cleanse them and rid them of any residual food odors. No matter how small, there is a kitchen hack for it all. Before you start to complain about your limited space, take a look around and notice what small changes you could make so your kitchen world work better for you and your needs.